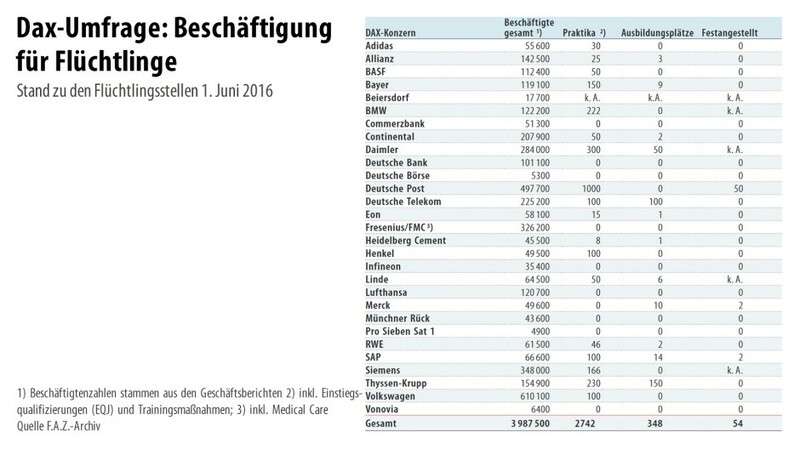 Dax-Consortium contains the 30 biggest company in Germany. Huge names like Adidas, BMW, VolksWagen, Mercedes, SIEMENS, Henkel, Allianz etc belong to them, combined they have 4 million employees in Germany and 2700 interns. And they are one of the biggest supporters of Merkel and her immigrant policy. They actively participate in the propaganda since the beginning, their main topic is labor shortage and minimal wage. For example back in September of 2015 according to Dieter Zetsche, the CEO of Daimler (Mercedes): "Many refugees are young, well-trained and highly motivated. Just such people we are looking for. The refugees are a great opportunity for Germany. Much like decades ago the Turks they could help us to maintain or to increase our prosperity"
Last edited by Vilendor; 2016-07-06 at 02:54 PM. What are we supposed to discuss? Are we supposed to express outrage? They can hire whoever they want to hire. The one force of nature they call by name. This also seriously presupposed that most of the economic migrants to Europe of the past year or so are even interested, are there for something other than the proverbial snacks (i.e. the free stuff), which is... an optimistic supposition more than a realistic one. There will be alot of welfare going on. The point is the ceo's pushing their personal political point of view that the refugees are good for the country because they're highly skilled workers that companies need, haven't bought into their own point of views based on factual data of their businesses hiring of said refugees. The rest is just waiting for more hospitals/laboratories/observatories/etc to be opened. We obviously weren't prepared for such a large influx of neurosurgeons, physicists and engineers. Well if we had that many jobs to begin with, the whole refugee-crisis wouldn't be a big deal. But this is not the case. So I am not surprised. Merkel made our bed and we'll have to lie in it. Even tho it just got a "bit" more crowded. Let's just say I understand, why the right gained so much over the last year. The whole situation is fucked up. "Permanent employees". That would mean they are at least already trained and trusted. And yes, immigrants should not instantly fill up every and all trainee/employee positions. Because they are basically not assured to stay in germany. Immigrants are not going to get guaranteed jobs just because they're immigrants. Maybe its less that they dont want to hire these refugees and more that the refugees dont actually want to get hired. Germany is asking every country in the EU to add to its popuation millions of people who seem to be unwilling to work. And we wonder why Brexit happened. Its a minimum wage job. Its guaranteed even more so because its cheap labor. The Immigrants dont want the job. They are most likely not even applying. Last edited by Zeek Daniels; 2016-07-06 at 03:07 PM. Change the Topic pls. It's about the 30 biggest companies in germany. Not all companies like you depicting in your headline. This has nothing to do with the will to work of refugees. Last edited by Iamsmol; 2016-07-06 at 03:09 PM. DAX is for the German economy what the Bundesliga is for soccer in Germany, they are the biggest companies trading shares but they do not represent all of German companies let alone the economy. The article speaks of the majority finding jobs in small and medium-sized businesses with a lot having to offer training programmes first. It makes sense if you look at the common distribution of jobs within Germany. The gist of the article is: The DAX companies were making the loudest sound about getting refugees into jobs whilst in reality it's up to non-DAX companies to actually make that promise true. He seeks them here, he seeks them there, he seeks those lupins everywhere! Obviously it takes time to integrate 2 million immigrants into the german economy. Do you want to discuss anything here? Or is this supposed to be just another immigrant hate thread? What about letting them join the Bundeswehr? Of course after passing extensive background checks and so forth. And commit to at least five years of service with a spotless record, after which they receive German citizenship. I think the US has a similar sort of thing where willing immigrants can serve in the US armed forces for a quicker path to citizenship. I think that's only during war time in the US. Which I suppose technically we're at war with ISIS. 2) pass the required test and get proper certifications in the country to practice (heavily relies on #1). this kind of thing can take years especially for people who have doctorates but hey keep spreading the immigrant hate. These are banks, engineering firms, car companies, telecoms. And they probably use german as their working language. Did you really expect many recent immigrants to be able to outperform all the local german jobseekers? Is that how WW2 happened? Lots of unemployed people in one city, then they vote to go to war?